Carol and her French husband Michel have to look after their villa and land whilst juggling busy international careers – he as a film producer, she as an actress. They bought the villa fairly impulsively (that is covered in the first book, The Olive Farm), but it has become their home. 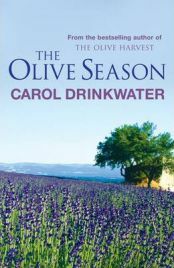 Carol’s writing is filled with passion for the South of France , but in particular for their villa, Appassionata, and their plot of land with olive trees and vegetable garden. While she is at the villa, her descriptions are beautiful, loving and have a relaxed, rather languid feel about them – she does not rush her descriptions and the text has a low feel to it which perfectly matches the hot South of France subject matter. However, when Carol is away from home her writing takes on a different tone. You can feel her longing to be back there as she dreams about the smells of the land and flowers, or the feel of the plants. These qualities in her writing really transport you to the South of France. The Olive Season does not hold anything back. While some travel writers might choose to leave out particularly personal events, Carol goes through some truly tragic events in the time this book covers, and lays herself and her feelings bare. This gives the reader more of a connection to her; you can understand her more, she becomes a person rather than just a writer. You experience her sorrow but equally her joy along with her. I think it was perhaps exactly this which caused me not to love her writing the first time around. I felt it was too florid and emotional for travel writing, but I thoroughly enjoyed it second time round. The Olive Season is also interspersed with interesting facts and history on relevant subjects. Carol and Michel are hoping to have a beekeeper place some hives on their land, and so she is reading up on beekeeping and its history, much of which she shares, along with history of olive farming and other subjects. Although perhaps unnecessary to the telling of her story, it adds a little something extra, a little depth and knowledge. While I still wouldn’t rank Carol Drinkwater with the best (Peter Mayle and Annie Hawes in my opinion), she is now among my favourites, top of the list apart from those two. The second time round, the warmth and honesty of The Olive Season really touched me. The Olive Season could be read and followed on its own, but I would recommend starting with The Olive Farm, the first in the series. No Comments on "The Olive Season"